Tim Heng, a Colorado native, has been involved in the fly fishing industry in the Roaring Fork Valley for almost thirty years. 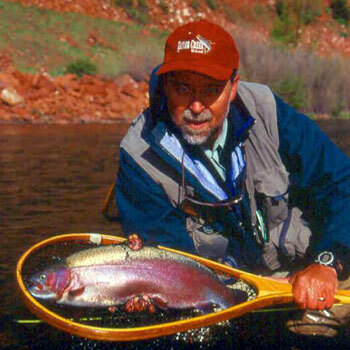 Tim established the first fly fishing shop in Glenwood Springs, Colorado and helped pioneer drift boat fly fishing on the Roaring Fork River in the early 1980s. Tim Heng joined Taylor Creek Fly Shop in 1990, the oldest fly shop in the Roaring Fork Valley with the most experienced guide staff. Tim Heng has fished just about every inch of the Frying Pan River in Colorado and has been doing it for almost 30 years. Learn all about the Frying Pan and the secrets of hooking up with its big trout. Tim Heng has fished the Roaring Fork River in Colorado for 30 years. Learn all about fly fishing the Roaring Fork and the secrets of hooking up with the lunkers that call it home.. He has also sponsored many fly fishing trips to Christmas Island; Ascension Bay, Mexico; Patagonia, Argentina; Los Roques, Venezuela; and Andros Island in the Bahamas. Tim enjoys tying flies and is an Umpqua contract fly designer and the creator of the Autumn Splendor and BLM (beaded little mayfly). The BLM was awarded the fly of the year in 2002 by Flyfisherman Magazine. Tim has appeared on ESPN and ESPN2 and continues to write and speak at many of the fly fishing shows. For more information on Tim and the Taylor Creek Fly Shops visit: www.TaylorCreek.com.